We've been having a LOT of fun in the kitchen this year for our holiday break and today's adventure was trying to replicate those sweet, buttery, delicious pretzels you get at the mall. My child has become addicted to them, which I don't mind but I can't stand the mall. Especially with holiday crowds, the crazy drivers, the sick people..shudder. So we needed to figure this out. I used this recipe from the Midget Momma blog and it was good EXCEPT it calls for 4 1/2 C flour and I used 2 extra cups (6 1/2 C total) to get it to be a dough instead of a batter. But other than that I followed her recipe and they turned out GREAT. I found another almost identical recipe (but with better pictures) here on Yammie's Noshery. Success! Without the mall! DOUBLE WIN! One last thing - those two plates in that picture above are two of the FOUR that we filled, so consider yourself warned, you will have a LOT of pretzel bites from this recipe. Not necessarily a problem. We also melted mozzarella on top of one batch, amazing. 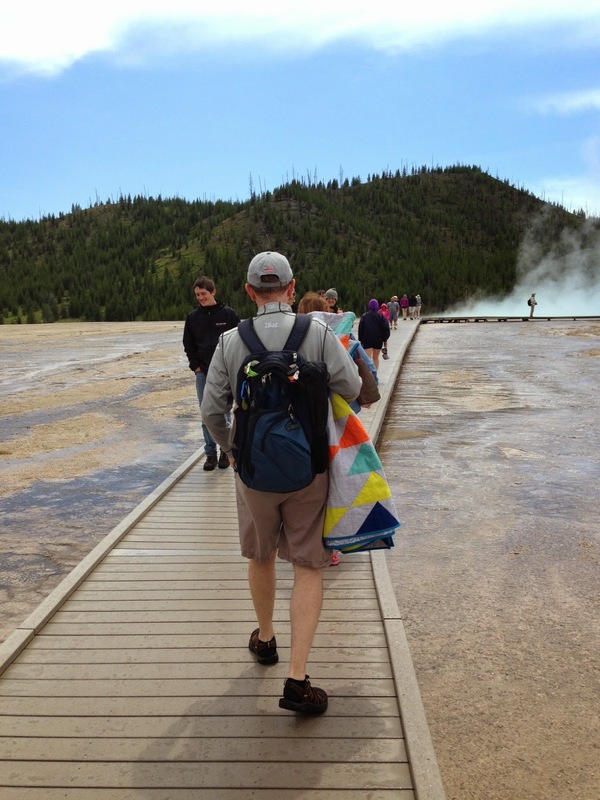 Hope your holidays were great and you're enjoying this last bit of 2014. 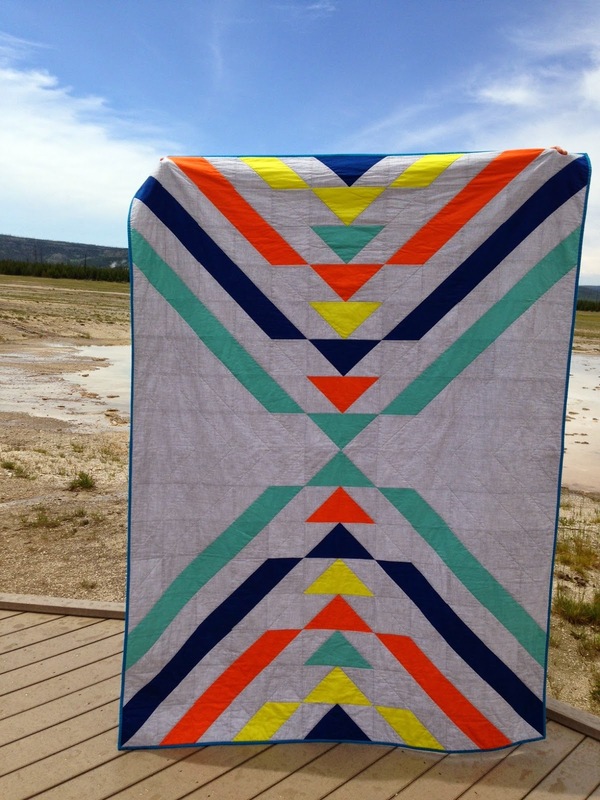 Mini Quilt Monday Amy Butler Edition and Sew Mama Sew Giveaway Day! Maureen wrote a wonderful tutorial on her blog right here. I used her method and just changed the sizes, which I'm happy to share with you. I included a few process photos here so you get the idea but Maureen's are way prettier! This mini took 15"x18" of batting, sub-cut into strips 2.5"x18". I used a pile of Amy Butler scraps, one fat quarter for the backing and two 2.5"xWOF strips for the binding. Mark the angles on each strip of batting. I used the 45 degree angle but you do whatever you like. I think NOT marking them and making a wonky one would be fantastic too. Oh and one made of just solids and and and...sorry, distracted! The way you start is with one strip right side UP along the pencil line you marked and another strip right side DOWN along the same line. Sew along with 1/4" seam allowance. Press open. Keep adding strips the same way, all right sides DOWN - the first strip is the only one that you lay on there right side up. When you have all the batting covered flip it over and trim off the edges. That's it! Seriously easy-peasy. You then join your strips and press the seam allowances open. I felt that I had enough going on that I wanted to keep the quilting simple so I just quilted along the side of each strip, which also joined it to the backing. Done! This finished at 12"x18" and I couldn't be happier with it. So today is the day all the sewing world rejoices and the heavens part and the angels sing because it's Sew Mama Sew GIVEAWAY DAY!! Whoohoo! I love it and I'm giving away this mini as part of the fun. If you'd like to follow me here or on Bloglovin or IG I'd be thrilled but it's not required. Giveaway is open until Friday at midnight EST, winner announced Saturday. As always, a HUGE thank you for taking the time to stop by and Happy Giveaway Day! This is beautiful, Darcy! So far I've made a couple of pillows and a kindle cover. There's another kindle cover on the list, lots of two-zipped pouched and gift bags....thanks for the chance to win. I'd love to add this to my mini wall! Happy Friday! I have the sweetest little project to share this week and if you know someone getting an eReader or an iPad it would make a great companion gift. I prefer reading the old-fashioned way but when you travel with a small person and you realize how much accompanying stuff goes in your bag anything you can simplify is good. So Santa kindly gave me a Kindle Paperwhite to travel with this year and I immediately whipped up a cover for it. I used this tutorial from Anne Kelle and I'll direct you there for the instructions BUT I wanted to share the modifications I used. I started with the "penelope" version. I used a 1/4" seam allowance throughout - same as the tutorial. This is a great scrap project and it was perfect for some long-hoarded Melody Miller scraps. 2 pieces each for cover, lining and fusible fleece each 8.5"x6.5" I fuse the fleece to the lining fabrics not the exterior, that way it doesn't change the look or feel of the fabric that shows. Here's my big switch (which isn't that big but anyway) I lined my pocket and made it a big shorter. I'm only planning on putting the charging cord in there and I liked it shorter to show off the exterior fabric. Cut exterior, lining and decor bond (1 each) 6.25"x 6.5" Fuse the decor bond to the pocket lining fabric. Place pocket and lining RIGHT SIDES together and stitch along one of the 6.5" sides. Turn inside out, iron and topstitch. Voila! Lined pocket. One other tip - I use skinny hairbands for the elastic loop and I stitch them down first and then snip the edges off. I sewed the exterior, pocket and lining together exactly the same as the tutorial and used a vintage button from my button stash (yes, I have a button stash, it just happened) on each. They feel like just the right amount of protection without being too bulky and the button/loop closure seems way easier than a zipper for something this small. I was so happy with the way these turned out and they took loner to cut out and interface than sew together. Tutorial on Anne Kelle blog also has iPad measurements! OK, so now on to the Kindle Unlimited feature - anyone using it? Like it? Hate it? I got the 6 month trial because it was so inexpensive but I feel like I've already looked for a LOT of fiction that isn't included so I'm not sure whether I'll ultimately keep it. Love to hear anyone else's experience! It's that time of the year when my thoughts turn to baking and cookies are at the top of the list. In case you're always on the lookout for new yummy recipes like I am I thought I'd share a few cookie recipes this month. Have one to share? I'd love for you to leave a link in the comments! 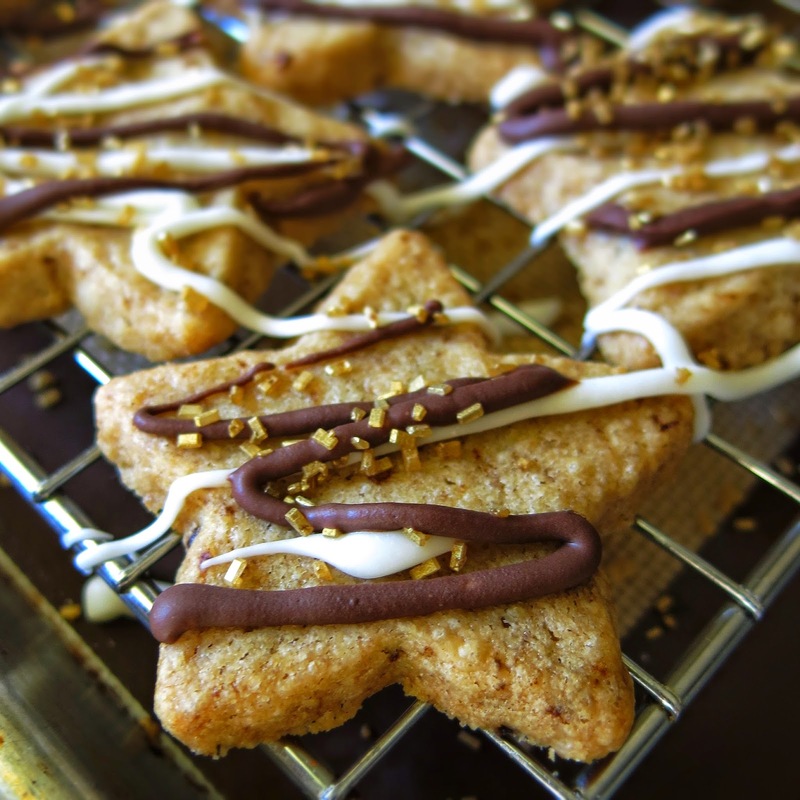 These are the Sparkling Coffee Stars found in this year's edition of America's Test Kitchen Best Ever Christmas cookies. - The recipe calls for using parchment paper to bake on, do NOT think you can substitute silpats and get the same result. My first batch baked on silpats spread way more than the next batch that I baked on parchment paper. - The 1 Tablespoon of espresso powder actually gave these a fairly mild coffee flavor - if you really love coffee you may want to add more. - The re-rolled scraps spread way more than the initial rolling, even with chilling the scraps before I cut them. They still taste great they just spread more and didn't look at pretty. - I also tried a few cookies with a larger cutter than the 2" one specified in the recipe (mine was about 3.5"), the smaller cookies definitely spread less and baked faster. I'd do all with smaller cutter next time. cream together until just mixed, then separate into 2 disks, wrap in plastic and refrigerate for at least 2 hours. Bake cookies on parchment lined sheets for 18 - 22 minutes. Cool on pan for 5 minutes and then finish cooling on racks. Melt chocolates in separate bowls at 50% power at 30 second intervals, stirring between each, until melted. 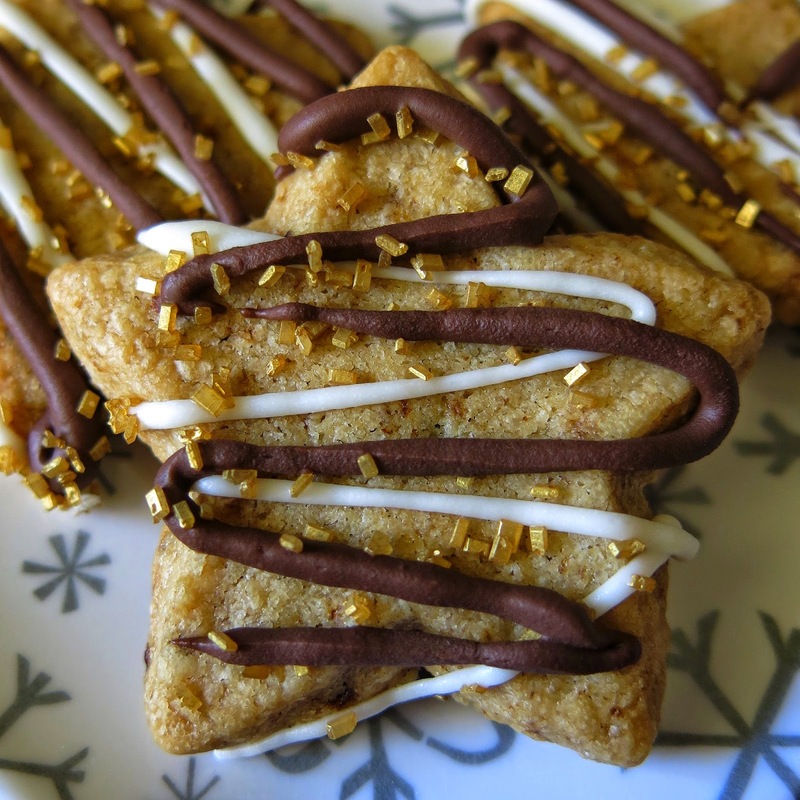 Drizzle cookies with chocolate and sprinkle with sugar (I used gold sanding sugar - extra festive ;-). Let chocolate set for 15 minutes before serving. Makes about 48 2" cookies. I made these last year using the Sugar Plum Forest Mini Quilts pattern from Quilts by Emily - you can find this pattern in her Craftsy store right here or in her Etsy shop here. Both of these are perfect for scraps and I'm thinking about making one in greens and grays to keep up in January too - I always like to switch to something wintery after the holidays and I think this might work perfectly. I also like to get a little more contrast between the trees and the background next time. I added a little hand stitching around the star to get it to stand out a bit more. This one finishes at about 12"x16". This is the smaller of the two patterns included and finishes at around 9"x14" - super quick to whip up and such a sweet decoration. Hope you have a good week, whether shopping or sewing! Is it wrong to say "Happy Monday"? It feels kind of wrong BUT it is a holiday week and I do have another great mini to share so there are things to be happy about! I wanted to make a BIG economy block (or square-in-square - I've heard it called both names) so I did the scary quilt math and came up with a block that finishes at almost 20" square. I mainly use solids when I'm testing my quilt math - I have a big stash of them, they're usually less expensive than prints and they really let me see how the shapes are working together. I think scale (the size) of your block or blocks is an easy way to make a big impact with a mini quilt. Have a fussy little block that you like but don't want to make a million of them? Turn it into one giant block! All it takes is one great block to make a splash and if I can figure out the math with my sad, sad skills then you probably can too. I decided to finish this block and turn it into a mini by adding some texture with the quilting (not matchstick but 1/4" with my presser foot) and a fun print border from my stash. This would be a great mini to make for someone with very specific color requests and it will certainly stand out when hanging on the wall (or front door ;-). I'll share the measurements for this mini on Wednesday and then on Friday show you the project I really had in mind when I developed it. Hope everyone good week, whether you're traveling or cooking or sewing! Thanks as always, for stopping by. It's that time of year, when I'm always looking for a cute teacher gift or stocking stuffer or something to personalize for the grandmas and I think I've found an awesome idea this year. I wanted to share because I know I'm not alone on this hunt! So here's what you need: a plain white mug (ours came from IKEA) and an OIL based Sharpie paint pen (I found this one at Walmart in the craft section). Draw your designs on your clean, dry mugs with your paint pen. I let Harper do her own designs on these and write the names - cute right? Then let them dry for 24 hours. Put the mugs right on the rack in the oven and turn the oven on to 400 degrees - you want to let your mugs heat up and cool down WITH the oven. You're basically using your oven as a kiln to cure the paint and any sudden temperature changes could cause the mug to break, and you to cry. So put the mugs in, turn the oven on and set your timer for 40 minutes. This part didn't smell great but running the fan helped clear it out. After 40 minutes turn off the oven and DO NOT OPEN THE DOOR until the mugs and oven are completely cool. You could leave them overnight if you bake them in the evening, we waited probably 3 hours before opening the oven. That's it! Pretty easy right? And these have been used, washed and run through the dishwasher and they came out completely fine! Add a cute mug rug and some cocoa or chocolate and you have a great teacher gift (or in our case grandma gifts). This was the tutorial I used if you'd like to check it out over at Who Needs A Cape. 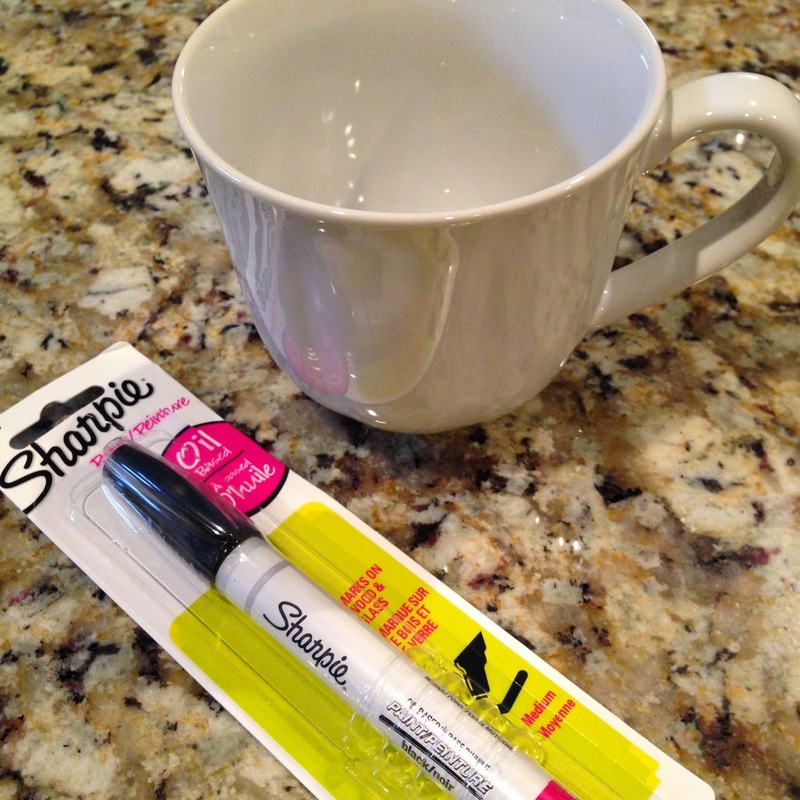 You can also search Pinterest for "sharpie mug tutorial" to see other awesome design ideas. It's officially a thing: Mini Quilt Monday. Well it's going to be my thing anyway! 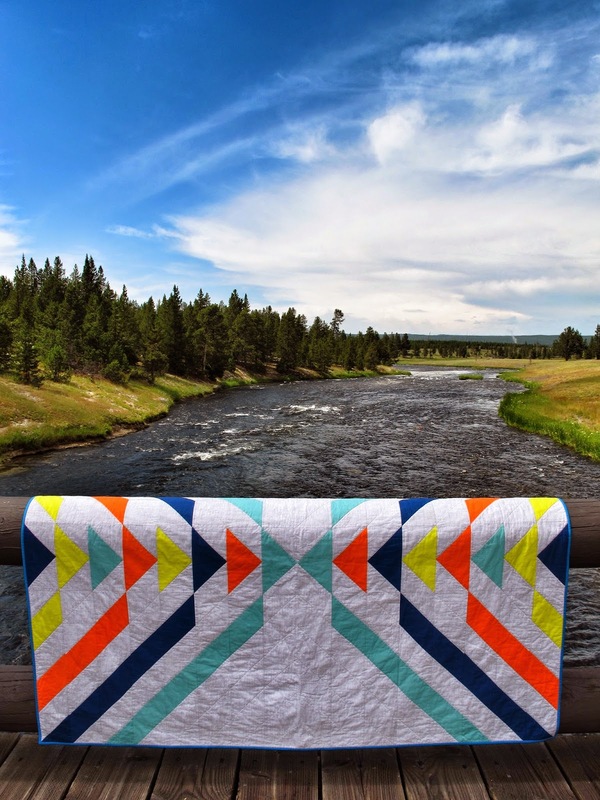 I love mini quilts and with the 3rd round of the Schnitzel & Boo mini quilt swap starting up on IG (and flickr) I figure this is a good way to share some inspiration. 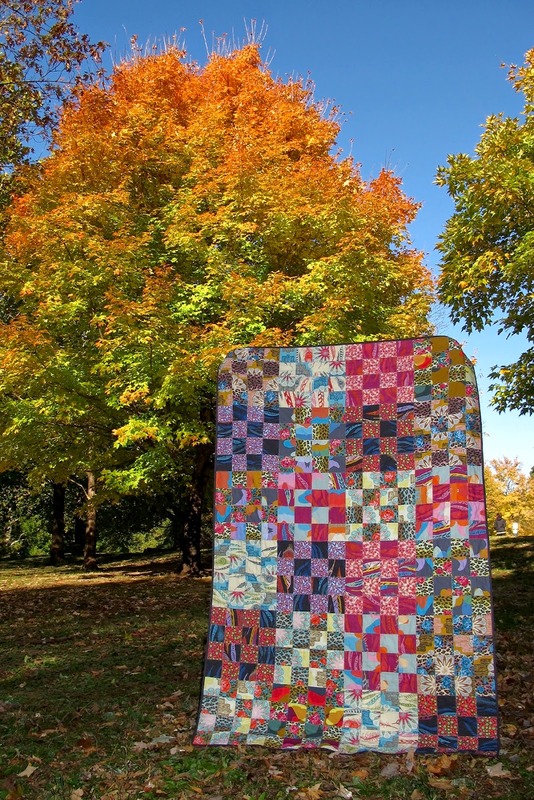 This quilt measures 21"x24" and uses a mini charm pack that Carolyn Friedlander gave out during her SewDown Nashville classes - it was a gorgeous mix of her fabric and other Robert Kaufman favorites. I loved it but I had no idea what to do with it until I decided to use them to make a mini. I pieced the square together first to get the arrangement I liked - I love the contrast that the pop of orange gives. So after the mini charm (2.5") squares were arranged I started pulling other neutrals including some Lotta Jansdotter from my stash and a chambray Essex yarn dyed linen. So I built the rows, measuring as I went, then sewed them together and added the Essex border last. It was kind of like improv but with measuring (go ahead and laugh, I know how ridiculous it sounds). Finally I added the orange binding, which is Kona because I couldn't bear to cut up the actual orange CF print in the quilt for the border! I'm a nut - I know. 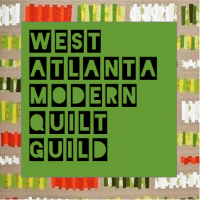 So I"m going to start sharing mini quilts maybe not every Monday (I'm not crazy enough to think I can crank one out every week during the holiday season) but I'd like to make it a regular feature. And if you've posted about a mini you've made lately I'd love for you to share a link to it in the comments! Thanks for stopping by - hope you stay warm on this wet chilly Monday. Happy Friday! It always feels a bit like crossing the finish line of the marathon doesn't it? And I suspect it will start to feel more like finishing a triathlon by the end of December ;-) Today I have my finished birthday quilt to share! My birthday was back in October and I decided to do a bit of selfish sewing and make myself a quilt. I also cut into a hoarded FQ bundle of AMH linen, which felt quite exhilarating (it doesn't take much around here). I used one of my favorite patterns, the St. Louis 16 patch and I was thrilled to realize that since the linen is larger than regular quilting cotton I could get enough 4.5"x18" strips for a black and a half out of each FQ. so two FQ's of linen actually made THREE blocks! Sweet. I used 24 blocks (4x6 layout) in this quilt and it finished at about 56"x 84" (big - for me anyway). 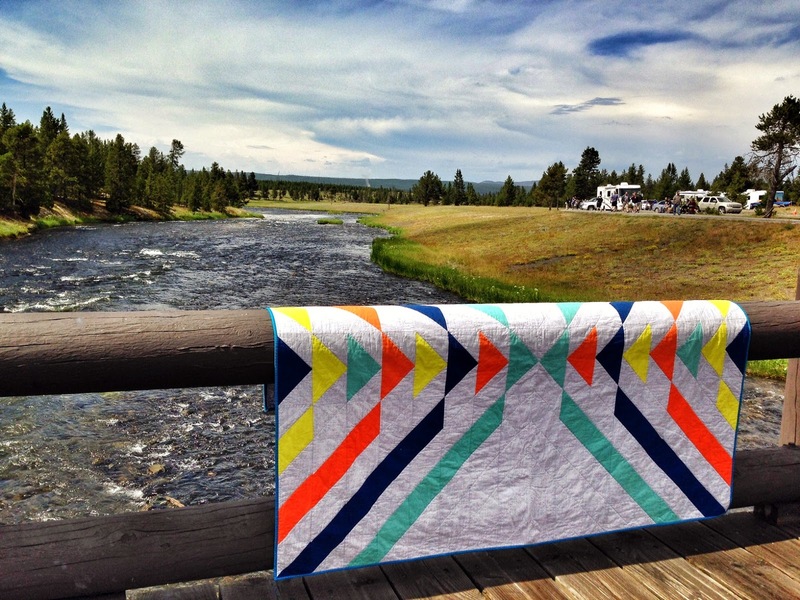 I've made a couple of these with 16 blocks (4x4 layout) which are a good size for a couch quilt or picnic in the park but this time I wanted something *really* good for the bed or ling enough to lay under on the couch completely. I'm happy to report that this size is perfect for that! I kind of hate to say it but I feel like we're at that point no matter how hard I try to deny it: this is a wonderful pattern for gift giving. GAH! The holidays! I know, I know, sorry. But anyway, this comes together quickly and always makes a great looking quilt. Just sayin. I used some AMH flannel from Stash Fabrics on the back which is just decadent. Between the linen and the flannel this turned out to be a heavy quilt which makes me so happy. I'm pretty sure the weight helps me sleep better (teehee). I quilted this one using a zigzag stitch on my old machine, just quilting right over each seam. I felt like it kind of gave it a crazy quilt look that went well with all the fabrics and colors mixed together. I felt so satisfying to make something for myself that I love so ridiculously much. It seems that the holiday sewing spirit has arrived! Happy Saturday! I had fun making samples for Quilt Market with some of the new collections from Blend Fabrics and I thought I'd share the way I made this owl tote. It was one of those simple projects that I thought turned out looking like a million bucks and the panel is what makes it. I pretty much love everything Cori Dantini does though, so I know I'm biased. 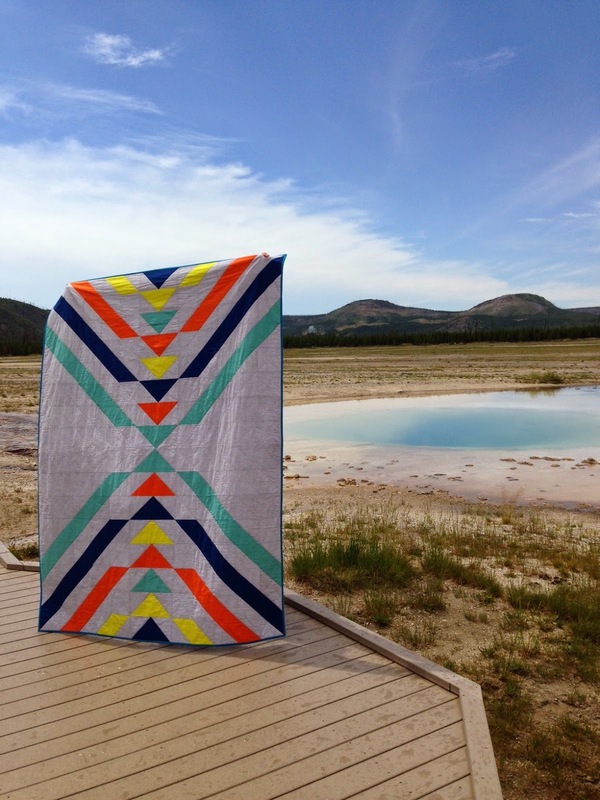 You could also cut a center square from any fabric that you want to feature! Strap: cut 1 WOF x 4"
I always like to line up the middle lines before I cut to try and get cuts as straight as possible. This particular panel has a border around it which you can include or remove. I had already cut the border off the top so I trimmed it off the bottom and sides as well. Just FYI: panels are always wonky. No biggie. So your goal is to get a piece cut with straight edges. My owl measured 11.375" tall x 10" wide. Your piece might be slightly larger or smaller than mine. If it is SMALLER you need to increase the size of the border pieces slightly. If your piece is larger than mine you can just trim a bit more off when you trim. Make strap: Fold in half and iron, then fold sides into middle and iron again. Topstitch along the sides of strap and then fold in half and finger press at the middle. Cut in half to make two equal size strap pieces. NOTE: This makes a 1" wide strap, if you'd like a bigger strap just cut your initial strap piece wider. Assemble front panels: Sew borders on top and then add side pieces. Top borders: 4" x 10"
Side borders: 4.5" x 17"
SEAM ALLOWANCE for piecing is 1/4"
Trim front panel: I take any extra off the top to get the height to be 16.5" (this gives the impression of symmetry once the bottom of the bag is boxed). Fold the panel in half and finger press at the middle. Line the middle up at 8.5" (center of 17"). Trim any excess off the edges to get 17" total width. Fuse fleece to the exterior panels. After you've fused the fleece to the panels you can do some quilting on your exterior panels if you'd like to - I did a little stitching in the ditch around the owl and added a "frame" around it and that was it, I wanted to focus on the fabric so I didn't do much quilting. Cut 2" square from each panel (will be used to create the gussets or "box" the bag). Sew around all three side of exterior pieces with 1/2" SEAM ALLOWANCE (all remaining seams sewn with 1/2" allowance). Sew two sides of lining panels together. Leave an opening in the bottom of the lining (sew about 2" on each side) to turn bag through at the end. Pinch bag sides and bottom together - I like to nest seams to make sure they line up. Sew along the edge, making sure to backstitch at front and end. Turn bag exterior right side out. Center straps on front and back and pin. I pinned 6" apart. Slide bag exterior into lining, right sides together and pin around the top. Sew all the way around the top and then turn out through opening in the bottom of the lining. Hand-stitch or machine sew lining closed. Press bag around the top and then topstitch to finish. Voila! The world's cutest tote bag! I already said I was biased right?! If you have any questions or need help as you make one of these please let me know. You can check out all the cute fabrics Blend has on their website. I know that you can find this fabric at Hawthorne Threads. Thanks for stopping by!